Before walking into the rustic charm of The Watermill Theatre, I knew nothing of William Hone and his astonishing story. A man who wrote parodies of the Regency and government of 1817, sentenced to stand trial for the ‘crime’ of seditious libel and blasphemy three times in as many days. Ian Hislop and Nick Newman’s script is full of the characteristic satire you would expect, and abound with humour and wit. The cast, all but one multi-rolling, did a wonderful job of bringing a bundle of interesting characters to life. 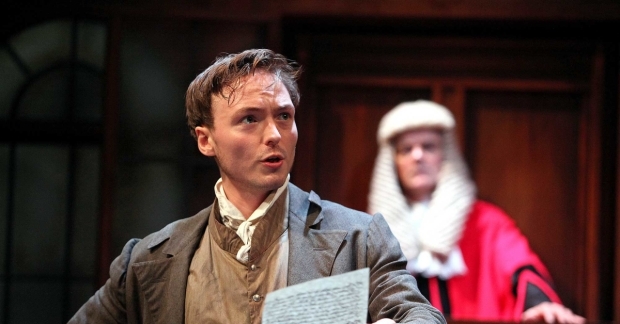 Jeremy Lloyd was a fabulously bawdy Prince Regent, Nicholas Murchie an Imperious Justice Abbott and Joseph Prowen held the show with a sturdy performance as Hone. Strong direction from Caroline Leslie, who previously directed Hislop and Newman’s ‘The Wipers Times’. She handles a play that bounces from place to place and character to character with a deft touch, keeping the story clean and clear at all times. The Watermill, a perfect backdrop for this fun and informative history play, was used to the max, flitting between the courtroom, prison and tavern settings with ease. The set ingeniously designed by Dora Schweitzer, to make the most of the intimate space with tables popping out from the walls and the use of so many different entrances and exits it playfully bordered on farce. Trial By Laughter may be cut from the more traditional cloth of theatre-making but it did the important job of making it very clear how crucial it is to protect freedom of speech and freedom of the press and how the freedom to laugh at our leaders is still vital to this day.